The Woburn trial focused on a suspected childhood leukemia cancer cluster and the connection to toxic pollutants TCE and PCE in the municipal water supply. This webpage includes background information on the treatment of childhood leukemia. Between the late 1960s and now, the treatment of leukemia has changed significantly. In the 1950s, nearly all children with leukemia died. The survival rate for children today is about 75 percent and childhood leukemia is one of the most successfully treated cancers. Kersey, John, H. 1997, "Fifty Years of Studies of the Biology and Therapy of Childhood Leukemia", Blood vol 90 No 11, December 1, 1997. In the 1940s and 1950s treatment of leukemia was based on single agent chemotherapy. 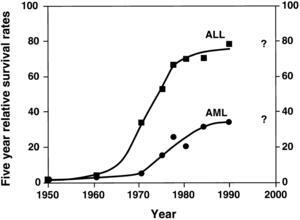 In the 1960s multi-agent chemotherapy began and dramatically increased survivorship (Kersey 1997 ). 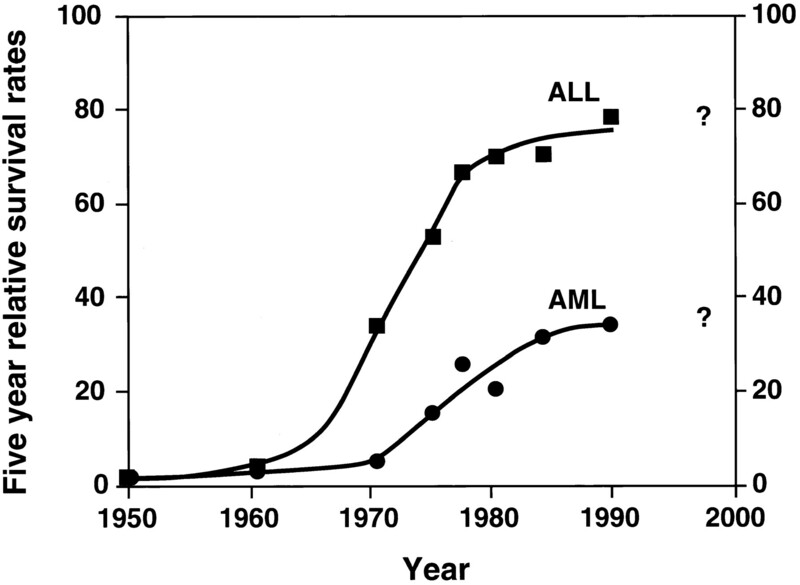 In the 1970s and 1980s pre-symptomatic therapy for central nervous system leukemia also improved treatment. In addition, alternative combinations and timings of chemotherapy improved treatment. Unfortunately, many leukemias developed drug resistance to chemotherapy when a patient relapsed. One solution was more intensive chemotherapy and total body irradiation followed by bone marrow transplantation. Bone marrow transplants were introduced in the 1970s for use when drug treatments did not work. In newer approaches, bone marrow is removed during remission and re-transplanted if the patient relapses. In the early 1970s brain and spinal column radiation (cranospinal radiation) was used to prevent central nervous system leukemia. This treatment reduced the rate of relapse from 50 to less than 10 percent. However, many survivors developed cognitive dysfunction that becomes apparent 2 to 5 years after treatment. This is called "late effects" (Kersey 1997 ). Currently, ALL leukemia is treated by chemotherapy, radiation therapy, or bone marrow or cord blood transplantation. Chemotherapy: Drugs are used to destroy cancer cells or stop them from growing. Typically, some form of chemotherapy will be part of the treatment plan for all patients with ALL. Radiation therapy: Children who have signs of disease in the central nervous system (brain and spinal cord) or have a high risk of the disease spreading to this area may receive radiation therapy to the brain. This type of therapy is not common. Bone marrow or cord blood transplant (also called a BMT): This is used for patients who are less likely to go in to remission with chemotherapy, as transplants can have serious risks. Kersey, John, H. 1997, "Fifty Years of Studies of the Biology and Therapy of Childhood Leukemia", Blood v. 90, n. 11, December 1, 1997.